Hi All, it’s Nicky here from Kitchen Sanctuary. We’ve had a beautifully warm week over in the UK. The flowers are blooming, the BBQs have started to make an appearance, and we’ve already discovered a small wasp’s nest in the kid’s play house! All the lush greenery outside made me want to create something bright and fresh for you today. 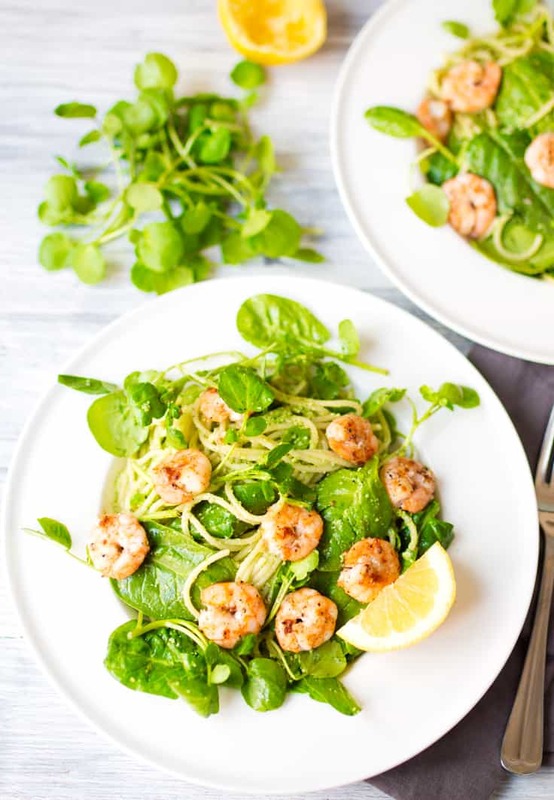 The result is this vibrant pasta dish, packed with a really flavourful green chilli pesto, some juicy garlic & black pepper shrimp and finished off with lots of baby spinach, watercress and a good squeeze of lemon juice. Nicky lives in Cheshire in the UK with her husband and two children. She blogs over atKitchen Sanctuary where she creates family friendly recipes and mouth-watering photos. Connect with Nicky on Facebook, Instagram, Pinterest and Twitter. 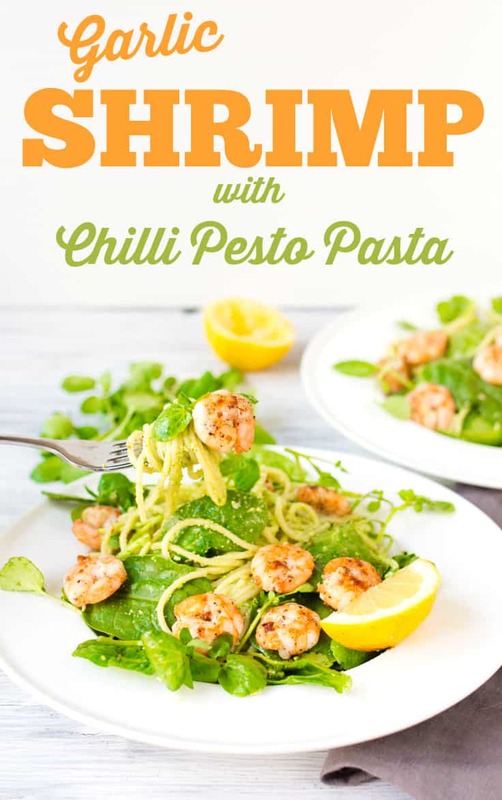 So easy to make – you can have it on the table in 20 minutes. 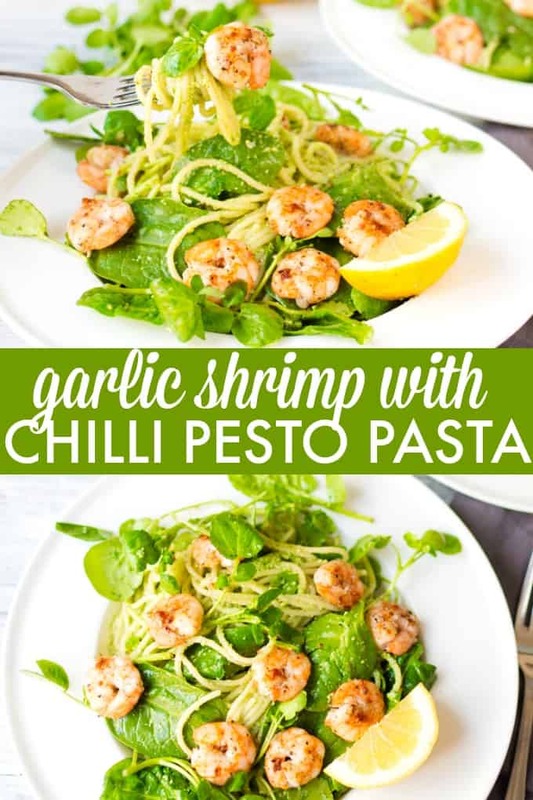 Fresh, healthy and simply amazing recipe for Garlic Shrimp with Chilli Pesto Pasta. Boil some water and then put the spaghetti on to cook as per the pack instructions. 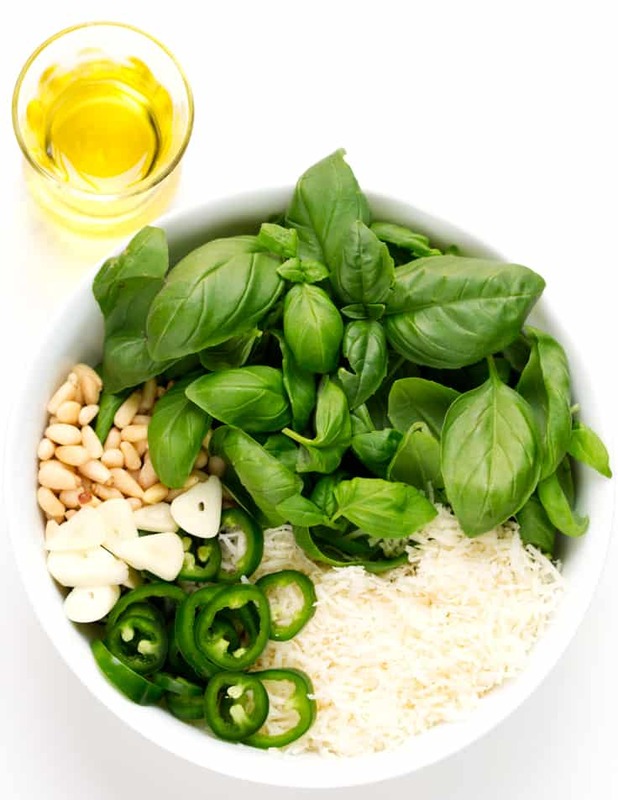 Whilst the spaghetti is cooking, place the basil, garlic, pine nuts, chilli and half of the oil into a mini chopper. Pulse the chopper a few times until everything is combined. Add in the rest of the oil, parmesan, a pinch of salt and pepper and the lemon juice and give another pulse. Have a taste and add a little more salt/pepper/lemon juice if needed. Put to one side. 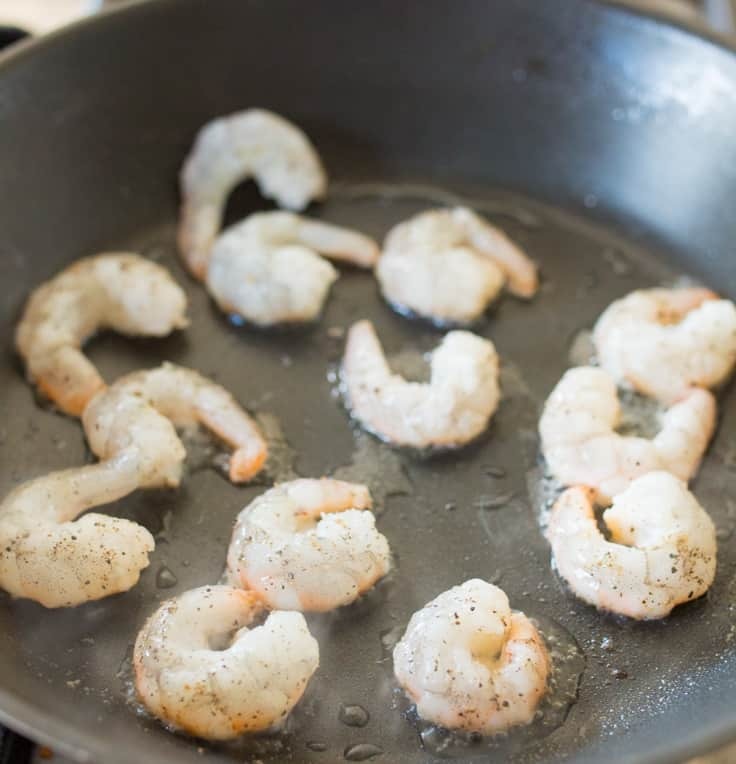 When your pasta is almost ready, heat the oil in a large frying pan on a high heat. 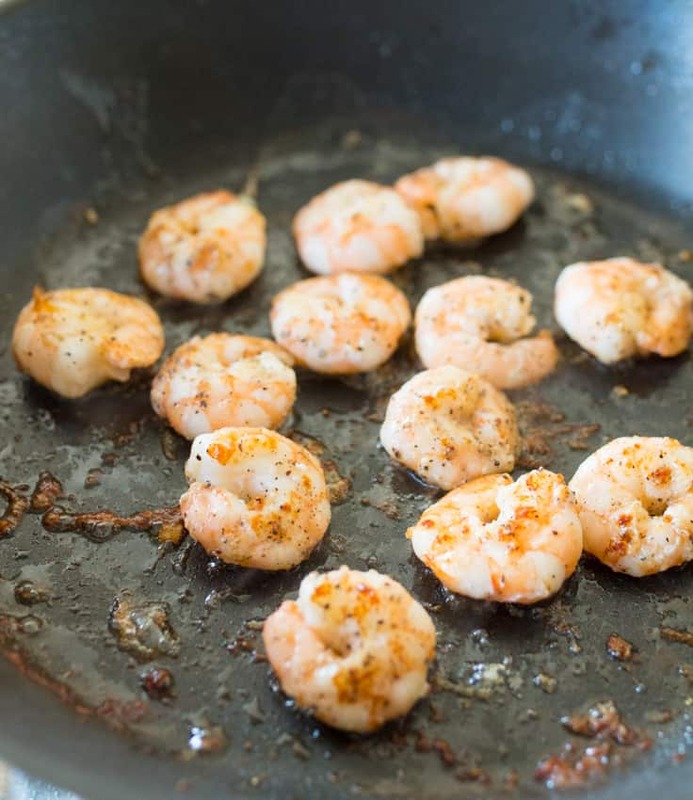 Sprinkle your shrimp with a good pinch of ground black pepper and then place in the frying pan. Cook for 1-2 minutes each side until they just start to turn pink, then turn the heat down and add the garlic. Cook, whilst stirring for 1 minute. 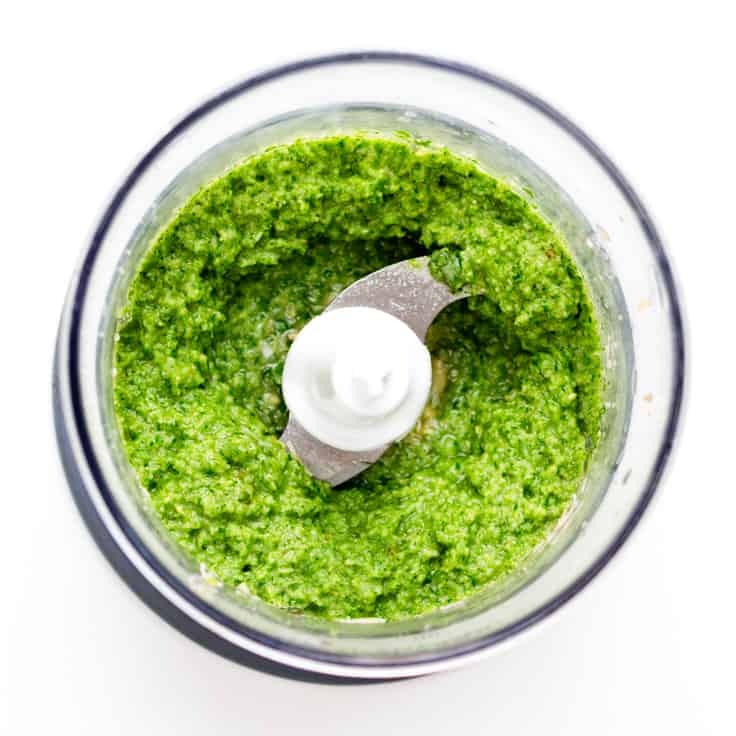 Drain the pasta, but reserve a little bit of the pasta water (this will help the pesto stick to the spaghetti). 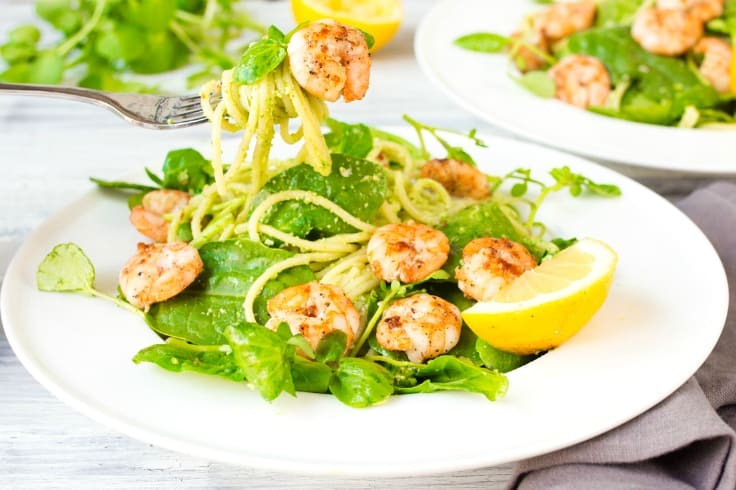 Place the spaghetti, pesto and 2 tbsp of the reserved pasta water in the frying pan with the shrimp. Toss everything together, then turn off the heat. 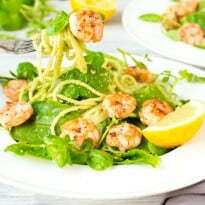 Add in the spinach and watercress and toss to coat in the pesto, then divide between 2 bowls. Garnish with lemon and serve.